You and your diamond ring are inseparable. You eat, sleep, and breath with it on and love how well made it is to stand up to life’s activities. But before you use it one more time as a scrubber brush to remove that caked-on lasagna sauce in your pan, read on! We’ll share some no-no’s you’ll want to avoid plus some tips you’ll want to follow for keeping your ring in great shape for years to come. In general, you definitely will want to avoid any situation where your ring could get especially dirty or hard to remove. You’ll want to keep in mind where your ring metal or stone falls on the Mohs scale of hardness. Consider taking extra special care for items on the softer side of the scale, meaning they are more fragile. Here are some activities below that can contribute to the wear and tear on your ring over time. What possibly could be wrong with wearing your ring during your hours of gentle slumber? Whether you realize it or not, you change sleep positions all night! This process could have you unknowingly putting pressure and body weight on your ring or getting your ring caught in your hair or clothing. All of these disturbances can loosen or reshape the setting or stone. You may think you are getting your dishes and your ring clean at the same time. What a deal, right? Actually, every time you hit your ring against a plate or other hard surface or use it as a creative scrubber brush for some stubborn residue, you are putting pressure on the stones and prongs, leading them to weaken over time. Harsh chemicals in cleaning products are not friends of your ring, either, as they can damage the stone and setting. Again, you may be congratulating yourself on multi-tasking by getting yourself and your ring clean when you shower or bath. Instead, your ring is not reaping any benefits from all the waterworks. Just as you can lose your ring while swimming, you can lose your ring when you are all lathered up with soap. This slippery condition can create just the perfect environment for your ring to fall right off your finger and down the drain. The soap you use can build up if it is oily and dull the finish on your diamond or scratch its finish if it is exfoliating. 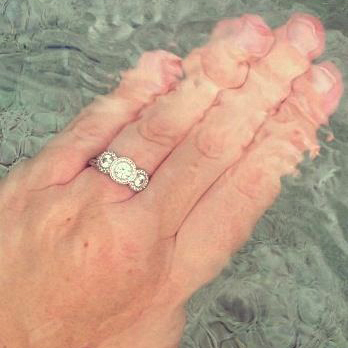 The next time you take a leisurely dip in the pool or at the seaside, don’t invite your ring! Chlorine in the pool can wreak havoc on your ring’s mounting, affecting the color and damaging the precious metal of the ring or wedding band. Also, do you notice how your fingers shrink in the water? Swimming changes your body’s temperature and causes it to drop, especially in cold water. This change can be enough to make the size of your finger smaller, and your ring may slip off and do a disappearing act during this time. Every time you swing a kettlebell or hit the floor for a burpee, your ring is at risk. When you apply pressure to a ring over time, the shape of the metal can change, and that can affect the strength of prong holding the diamonds. 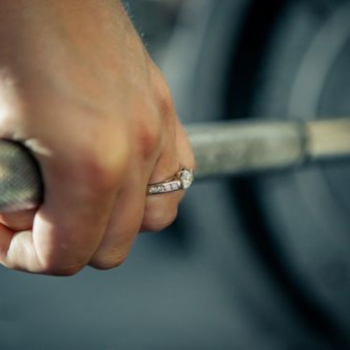 Lifting weights can scratch or loosen stones, especially pave or micropave stones. Sometimes, even sweat can react with metal and cause an allergic reaction. To avoid any of these unwanted circumstances, we suggest keeping your ring in a safe place when you work out. 1) Add a few drops of gentle liquid dish soap (not dishwasher detergent) to a cup of warm water. 2) Carefully drop your ring in the cup and let it soak in the soapy water for about 10 minutes. 3) When the time is up, take your ring out of the cup and gently brush it all over (stone and setting) with a soft toothbrush and rinse with warm water. Gently dry it with a soft cloth. 4) Sit back and admire how your ring shines after its eco-friendly, easy on your budget, do-it-yourself cleaning! If your ring needs a little more TLC than you can give it on your own, you might want to consider taking it for a professional cleaning. For jewelry that is important to you, having it cleaned and inspected twice a year by a jeweler you trust can give you priceless peace of mind. Now, go enjoy a bubble bath without your ring. It will be waiting for you when you are finished! For any questions and for all your fine jewelry needs, turn to Inter-Continental Jewelers. We have decades of expertise and superior quality products to offer you at incredible savings. We look forward to meeting you.